Eighteen months ago, in a professional capacity, I undertook a piece of research that involved speaking to carers, both paid and non-paid. The aim of the project was straightforward – to evaluate their reactions to some communication material and, based on that, suggest amendments. But it turned into much, much more. Over the course of a week, I spoke with almost 40 carers, broken into four groups. Some were caring for elderly relatives, usually parents, but sometimes uncles, aunts. Others were caring for their children, some with physical disabilities, other with intellectual disabilities, some with both. They spoke openly, passionately, and above all, honestly. The conversations I had with those people that week floored me. What they told me shocked me, and in sometimes, horrified me. The group discussions were scheduled to run for 90 minutes each. But such was the level of engagement, so eager were these people to be heard, that the sessions greatly overran. Timekeeping’s usually quite important when conducting qualitative research. In the last 30 minutes of a 90 minute group discussion, you can sometimes sense a respondent fatigue. Not so, here. Two hours, two hours and fifteen minutes – two and a half hours. They didn’t want to stop. This was the first time they had ever had an opportunity to air their fears, their frustrations and their exhaustions, and have somebody really listen to them. And I couldn’t stop listening. Caring is a full-time job. The second thing that struck me is that many of those who care for others full-time do not make a conscious decision to do so. Rather, it happens. A parent falls ill, and, needing full-time care, moves into their house. Their child is born needing full-time specialised care. Would these people have chosen caring roles as a career choice? No. Rather, they do it because they have to. Often – and they are willing to admit this – they have no aptitude towards caring, and it does not come naturally. Neither – and this is important – do non-paid carers get any training. Paid carers are trained, but family carers are thrown into the deep end with no support. But they have no choice. They have to do it, and they get on with it. The carers I spoke with were unflinchingly honest. They were willing to admit that sometimes they got angry and frustrated. Sometimes it might be with a parent calling them numerous times during the night. Other times, it may be with a child who had wet the bed for the second or third time that night. Sometimes sheer exhaustion and frustration led them to say things they regretted to those in their care. Sometimes they shouted. Sometimes, they had shocked themselves. “Anything can happen”, one said, “when people are deprived of their sleep”. With no support, no respite, this is exacerbated. Carers felt angry on behalf of those they care for. “What’s missing in our society is dignity and respect for our old people”, one said. “Once they’re past their sell-by date, they’re thrown on the scrapheap. They’re only an inconvenience”. Unanimously, carers felt invisible. They were shouting into a void, and no-one can hear, nor does anyone want to listen. What does the annual respite grant really mean to carers? Remember; however that caring is a full-time job. Carers often work around the clock, and do not have the means to earn an income. In addition, by providing care, they are saving the state the cost of providing this care on a residential basis. This care is provided for an allowance of as little as €200 a week (this can sometimes be the only household income). So, what does the respite grant mean? · Respite means a break. It allows a carer to pay for supervision, either at home, daycare or residential care, so that they have the peace of mind to take a break. Be that a holiday, or just some time free from the responsibility of caring. Reasonable in anyone’s book. · Respite grant money is often used to pay for additional therapy for the person in care, to improve their wellbeing, either physically or mentally. · The respite grant is not always used for “respite”. Because carers are low-income earners, sometimes it’s used to pay for car insurance, heating oil, or home repairs. Everyday expenses. And yes, often carers depend on it for this. There are many, many compelling arguments that can be made in favour of reversing this cut. We can express our outrage all we like, but it’s time to stand up and start doing something about it. There is still time to make a difference. Write a letter to your local TD. Or pick up the phone. Come out and protest (there is another protest outside Leinster House on Thursday 13th December at 11am. 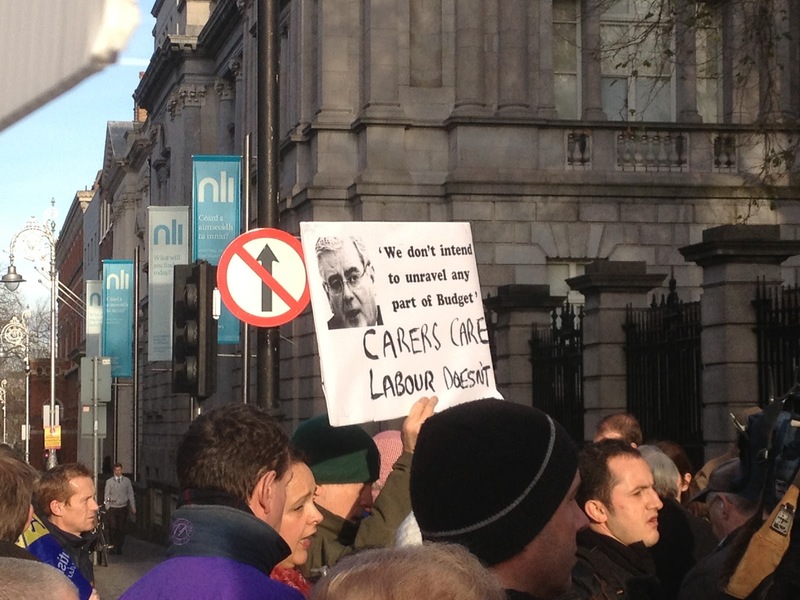 It’s not easy for carers to come out and protest – so we need to do this on their behalf.) The real mark of a society is how they treat their most vulnerable. Don’t give up. Speak up for those who can’t speak for themselves. And let’s tell our government what kind of a society we really want. Another issue which is not being highlighted is that there is a 12 month backlog in processing applications for Carers' Allowance leaving many who have come off Carers' Benefit with very little income. Thank you for this. I'd also be interested to know what proportion of carers are women. Many of the same comment apply, by the way, to single parents of young children 24 hours a day, seven days a week, 52 weeks a year. And there are also single parents who care for children with special needs alone. Some of them are on Twitter. Social media is sometimes te only proof against isolation, if it's available and accesible. I'm especially interested in how the State, and its policy treats elderly people. There is what amounts to little more than spin about the preference for”aging-in-place” or “in the community”, because it's supposed to cost less. Sure, if you devote no resources to it. If you have published material, I'd be delighted to cite it.